Oceans and Seas inc. has been a great resource for the marine enthusiast in the metro Detroit area over the past 37 years. We take pride in stocking a large selection of marine fish, corals, and other invertebrates. We receive weekly shipments from our suppliers, so we always have something new and beautiful. With over 4000 gallons of saltwater fish and reef invertebrates, our selection will satisfy even the most discerning hobbyist. Our staff includes hobbyist like yourself, with over 40 years of experience in reef keeping and saltwater fish. Since 1972 we have been providing the best selection of saltwater fish. 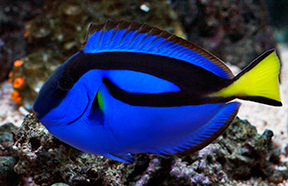 If you are looking for clown fish, angels, triggers, tangs, damsels, dotty backs we'll have them and more. You will find a great selection of healthy fish in our display tanks. We have over 4000 gallons of saltwater tanks on display. We receive many rare and hard to find species weekly. Our staff is very knowledgeable and can assist in compatibility, feeding and other questions you may have.